Civilizations have thrived and rejoiced along the flowing water! The same civilizations have fallen when the water advanced into their territory or when the sources dried up! If the global warming has caused the sea to advance and take the Mahabalipuram temples of Tamilnadu into her, the same adverse effect on nature has caused inadequate rainfall due to which the water level in the KRS dam of Mysore resides and the submerged temples show up inviting curious visitors. I wouldn’t know whether to call it irony but it’s a fact hard to digest! With all these stories raising questions in my head and having seen the stunning photographs of this submerged church on Wander Tales, I was getting more and more curious about the Shettihalli church. 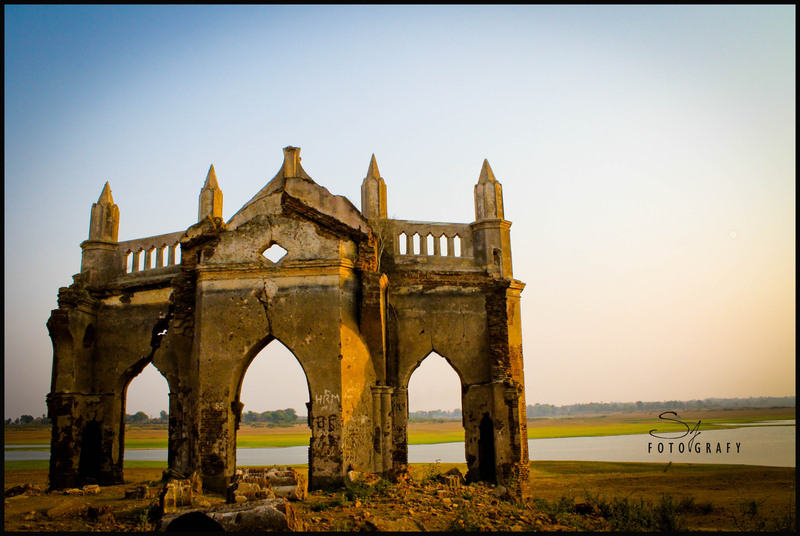 Finally I planned the visit this month as the ruin of the church is completely visible only during the summer months and is underwater post monsoon with only the tallest spire seen. I was eager to find the answers as I drove through the narrow, asphalted road that cuts through few quaint villages along the reservoir area before entering the junction at Jyothinagara. Just ahead is the newly built bridge across a river formed by reservoir and the ruin set amidst the vast shores of the river is imminently visible. A vast river bed that had gone dry after the water subsided along with the brown grass & shrubs just above the ground under the scorching sun; Soft, shiny and bright looking greener grass along the fertile banks of the flowing water cherishing their proximity to water; A silently flowing river which had turned bluish reflecting the entire sky & clouds; Encompassed by this picturesque landscape lay a rustic place of worship that overlooked this place for close to 200 years now, The Holy Rosary church. The very sight of the citadel itself transforms us into its rich past during the pre-British Empire. Records tell a sad story of this marvelous architectural beauty. 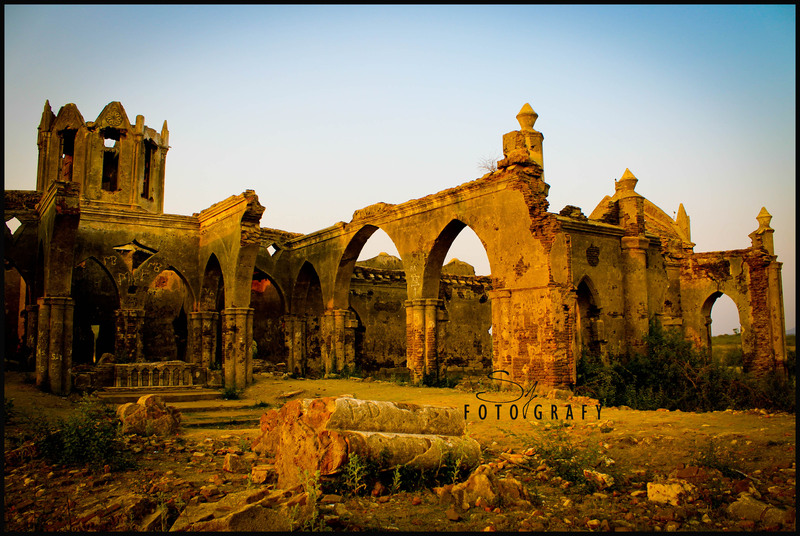 This church was built by the French missionaries for the wealthy estate owners of the area during early 18th century. Constructed in the Gothic style of architecture this church was probably the prime place of worship during its glory days. After independence, when the local government was compelled to contain River Hemavathy for irrigating the dry regions, Gorur dam was commissioned and all the villages that fell in the catchment area were asked to relocate. People, who were relocated to the nearby areas, went in search of a new retreat carrying all that they could leaving behind a mute spectator to witness the village being swallowed by water. Today, after more than two decades of its evacuation, this place is nothing but a river bed and the mute spectator still stands tall, though in a deteriorated state, as the lone witness to all that happened. 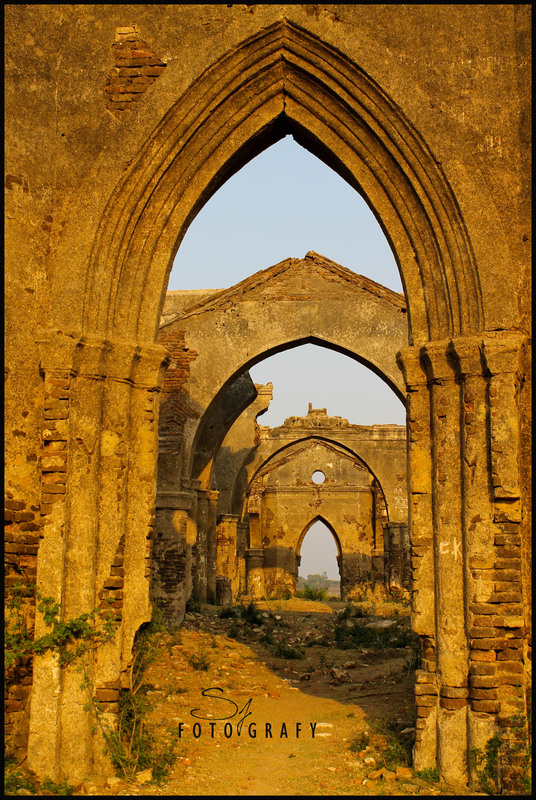 As we approach the ruins the questions only increase rather than finding an answer to the already intriguing ones! The church is built in the Holy Cross plan, something that would look like a cross if viewed aerially. It has three huge doorways, with the biggest one or main door on the southern side towards the river, forming the bottom of the cross and the other two along the eastern & western sides, forming the transept. 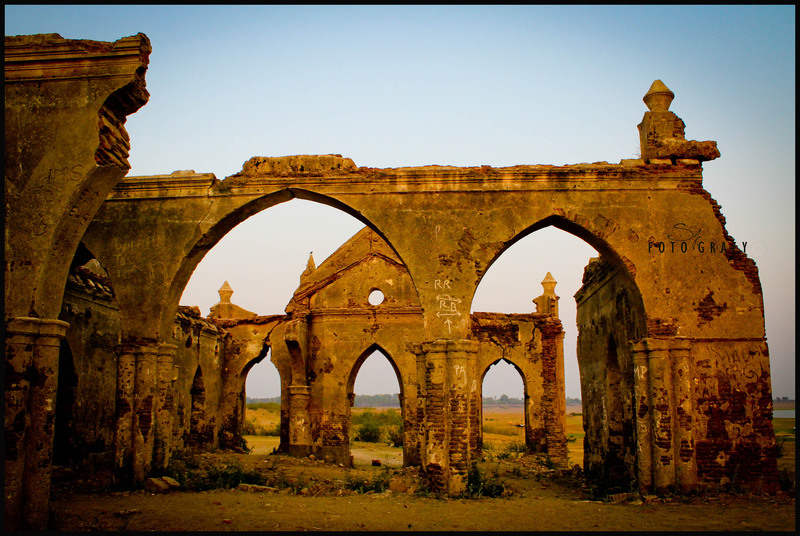 All three faces of the ruin have the typical pointed arch of the Gothic style and with ribbed vaults to make it evident. The nave or the place where public gather is long and the side walls are large and tall. These walls probably had stained glasses windows with mural arts depicting biblical incidents. The Main Door towards the South. In the background is the subsided reservoir. One of the major factors that astonish me is the size of the church. Even if the entire population of the present day village here had filled into the church there still would be space good enough to take another 50-100 people. Questions arise again! What would it have been like during its hey days? People flocking all around, lighting numerous candles and seeking blessings from the almighty! The picture itself gives goose bumps while standing amidst the reminiscent. Towards the north is the tallest part of the church, the bell tower. The construction of this tall, edged tower is a wonder in itself. Bricks stacked one upon another like bread slices, supported by huge stones at the bottom which in turn stands on another set of such brick stack that rises from the ground. This is another astounding factor of this colonial wonder! Not a single piece of iron or any metal could be found anywhere around. This big a structure with just mortar, jaggery and eggs! Today, this huge bell tower is home for many birds that wait for their catch in the nearby river. The altar and the eastern transept. The edged structure behind altar is the Bell tower. The altar is evident by the way it’s constructed. Though in shambles, one can only imagine how ceremonious would it have been while it was used. The church probably should have had a balcony as well. The rubbles on the wall seem to have had a ceiling where people could gather. The vaults on either sides of the main door also look like left over of a stairway. If a balcony stand existed then how many parishioners would have been here!? Another sight that surprises me is the craftsmanship on the walls even at the highest places on the pointed arches and more surprising is that it is intact in detail, keeping the spirit alive even after two centuries. The arches and pillars have some of the most beautiful craftsmanship. The main door with artwork and gothic spires. It probably had even a wooden stairway. 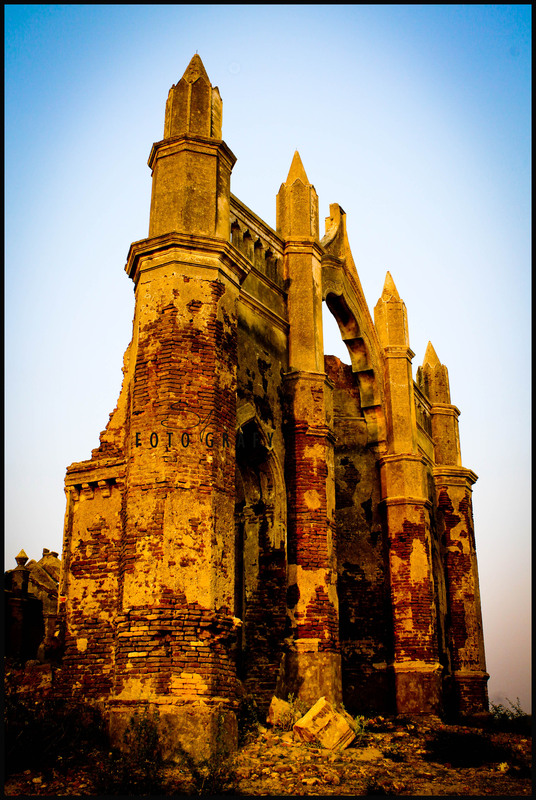 Though only the skeleton of the church stands today, entire side wall demolished and most part of the remaining walls posing wide cracks and looking shaky, it sure evokes elusive memories of the past. The crumbling walls seem to hold a thousand stories in them. Those of christenings, weddings, funerals and festivals that would have taken place here! Those of the wealthy landlords who discussed the changing law & governance! And their charming and pretty children dressed in Victorian frock coats & bell-shaped skirts! Their neck ties and hats! It would have been like a scene from the movies like Young Victoria or My fair lady! Pointed arch doors - Typically Gothic! Today all that is left over is the main frame and the transept with the bell tower. Broken beer bottles seem to be taking over the rumbles of walls that is scattered all over. Irresponsible tourists have tried their hand at art work on the walls that are weeping within. Complete preservation of this holy place does not seem to be in anybody’s agenda. 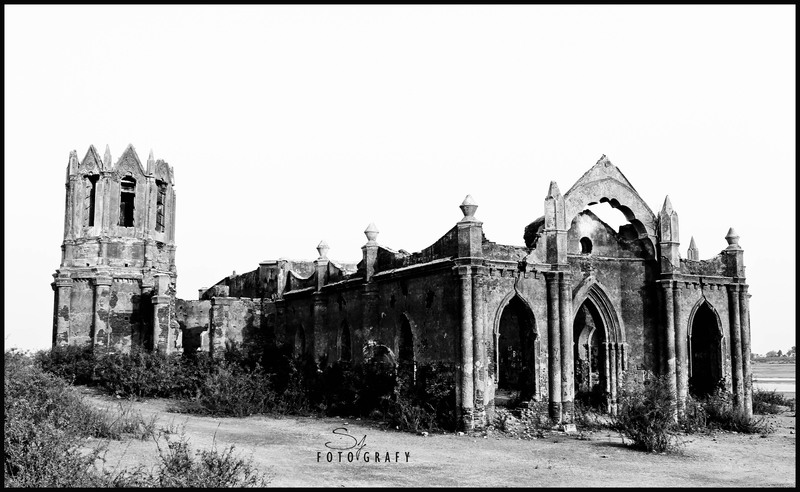 Amidst all this maligning inflicting pain, the Holy Rosary church still stands tall as the mute spectator like it did when the village was being washed away. Sunshine comes to console the silently sobbing ruin! The surrounding is deafeningly silent and the pale wind seems to be trying to tell all the untold stories. The unflappable atmosphere, so composed, so gratified and so complacent takes over. 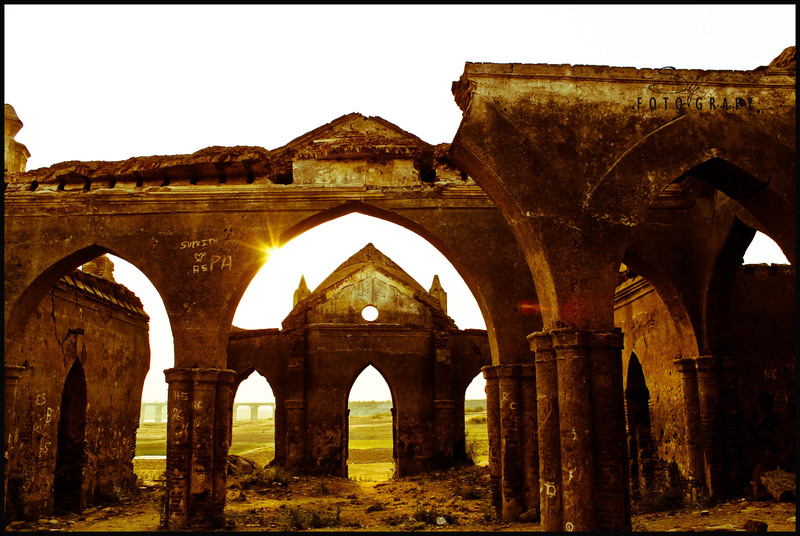 As I reconcile in the serene environment, the setting sun seems to be consoling the ruin adding charm to the structure with its golden rays. Questions still lingered in my mind and I continued my unsuccessful quest to find answers! 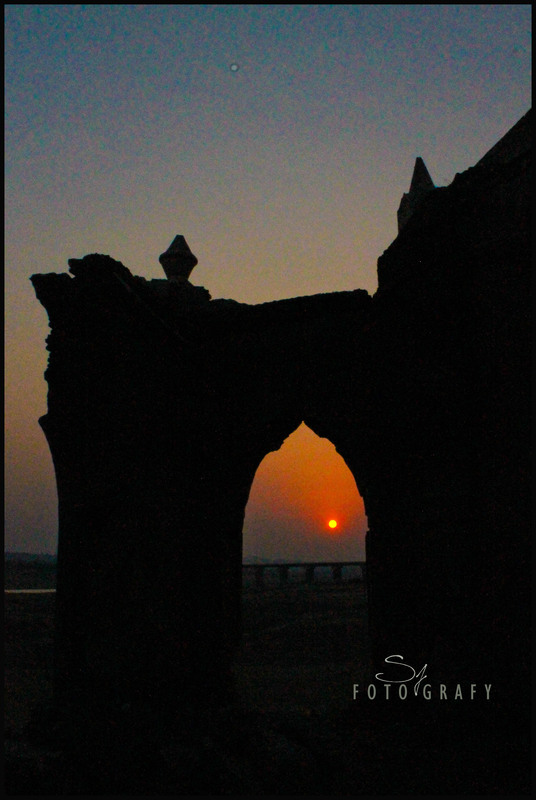 Another mute spectator, the Sun, sets on the ruin. Kreativ Blogger Award! I’m taken aback! What a beautiful photoessay. I haven’t seen Shettihalli, but its silent sobs have reached me. This place reminded me of my visit to Tintern Abbey in Wales. Spectacular! My eyes widened at awe of the photos…I cannot imagine my reaction if I actually stood at its presence! Thank you very much, Frances. The feel is beyond explaination while at this place! As a photographer and a Bangalorean this is one of the places that I really wanted to visit but still has not happened. This places looks better in rainy season as half of the church go underwater. Thanks for dropping in, Joshi!